So that was fast. I think I'm only 3 weeks away from the third trimester?! Is that even right?! Time is flying, and we have made zero preparations for this child, but being that it's our third girl, I could go into labor tomorrow and feel like we would be just fine. Although we did buy the 4Moms infant tub, and that was the most exciting moment of the past couple weeks. We are still holding off on doing anything with our 4th bedroom because we are planning on listing the house this summer/fall so I have been throwing myself into organizing everything. I've had to order more label maker refills than I care to admit and I'm pretty sure the donation trucks are tired of coming to my house. But it feels so good. I am really looking forward to my ultrasound in 3 weeks where they will hopefully tell me that my placenta previa has resolved itself and that I can be taken off of pelvic rest. Because the husband just joined a baseball league and the last thing I need is a hot husband in baseball pants while on pelvic rest. Knowwhatimsayin. Total Weight Gain: Not much has changed since 21 weeks, but still totally over where I should be! Working out pretty regularly has helped me gain no weight in a while! 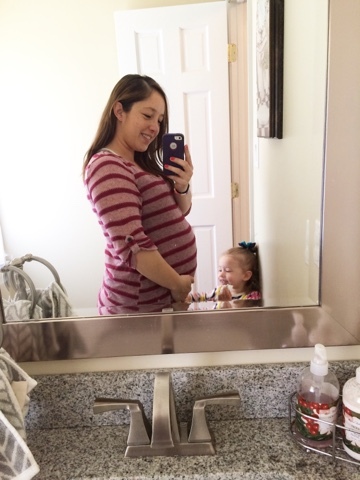 Maternity Clothes: I am down to a couple pairs of pants! So hurry up, summer! Movement: CRAZY all the time. Especially after a workout. What I miss: A good sushi roll! Cravings: Entire cantaloupes at a time. Symptoms: The nausea is at an all time minimum, hallelujah amen. What I'm looking forward to: Quinn's birthday! going on and that makes me a happy mama!